UNIST has been ranked seventh in the world based on the percentage of highly cited papers. UNIST placed seventh in South Korea and 54th in Asia. 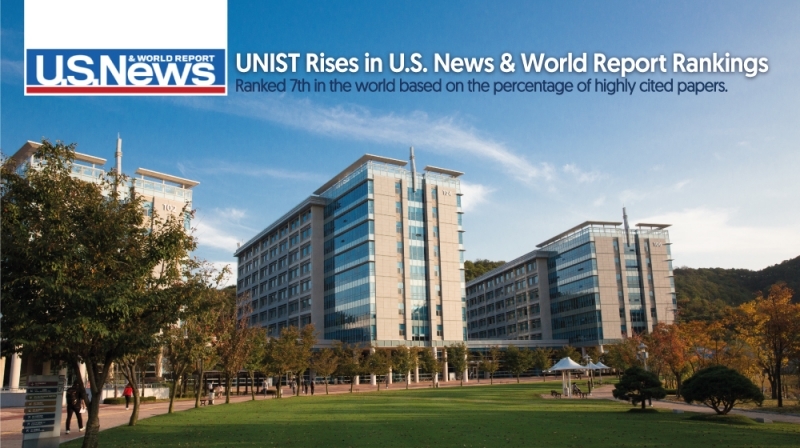 In a new set of 2016 U.S. News & World Report’s Global University Rankings, UNIST placed seventh in South Korea and 54th in Asia. Moreover, in terms of the percentage of highly cited papers, UNIST has also received strong marks by ranking in seventh place among the best uiversities in the world. This is UNIST’s first apperance in the annual global rankings list published by the U.S. News and World Report media company. UNIST has been placed seventh of higher education institutions in South Korea, just ahead of Kyungpook National University and Hanyang University. The top three in the nation are Seoul National University, KAIST, and Sungkyunkwan University. UNIST has been ranked 64th among Asian universities and its position among the world’s top universities is 387th. The top three in the global ranking are all American institutions: Harvard University, Massachusetts Institute of Technology (MIT) and the University of California, Berkeley. A total of 750 schools in 57 countries made the U.S. News Best Global Universities list, up from the top 500 universities in 49 countries ranked last year. They were ranked based on 12 indicators that measure their academic research performance and their global and regional reputations. In the new rankings, UNIST placed seventh in the world based on the percentage of total publications that are among the top 1 percent most highly cited papers. This percent of highly cited papers shows the number of highly cited papers for a university divided by the total number of documents it produces, represented as a percentage. It is a measure of excellence and can show what percentage of an institution’s output is among the most impactful papers in the world. This is a size-independent measure. The full 2016 U.S. News global rankings can be viewed HERE.